OS X 10.7.5 or later. 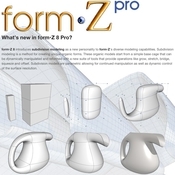 form•Z pro is a powerful 3D design application featuring a variety of modeling personalities and tools with an easy to use interface to express and communicate your imagination. It is based on advanced 3D solid and surface modeling methods that maintain accurate representations as you progress from design to visualization, layout, animation and fabrication.